Sandy Howell - Edwards Electronic Systems, Inc.
﻿Along with completing several computer programming classes, Sandy Howell earned her Associate Degree in Business Administration from ECPI in Norfolk, VA in 1984. Her prior employment background includes the medical and legal fields. She began employment as Administrative Assistant with Edwards Electronic Systems, Inc. in August of 1999. Her duties include accounting, contract billing, accounts payables, payroll, insurance and human resources for both the corporate office in Clayton and branch office in Concord. 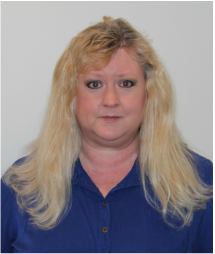 Sandy has the knowledge and training to be able to fill in for every clerical position at EES when necessary and is the “go-to” person when issues arise.